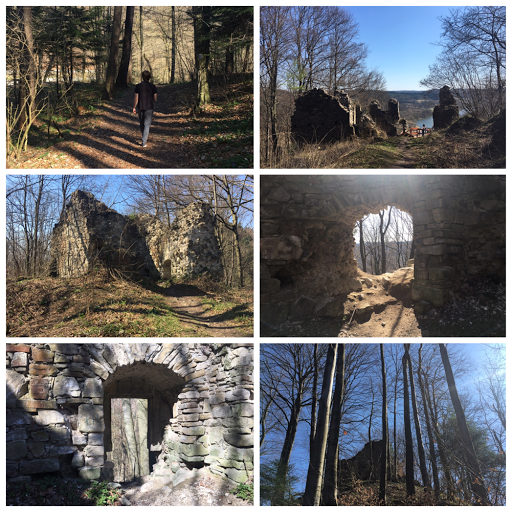 After liking Łańcut Castle, I guess Piotr decided that castles were a good place to visit and so en route back to Rzeszów from Lake Solina/Jezioro Solińskie in Bieszczady we drove to Sobień Castle, what can only really be described as a ruin. Just to start, I'm terrified of heights so I'm proud of somehow getting through a steep forestry path and up a ridiculous amount of wooden steps to the ruined castle. Once up the steps, the view was incredible and I wish we had got some more photographs of the lake and natural forestry surrounding the ruins as it was simply breathtaking, but we were concerned about disturbing a group of people sat closer to the ruins, which was a shame. The surrounding mountain range looks particularly impressive when looking around the castle walls. The castle itself is medieval and has royal roots, built to guard the merchant route along the river below in 1340. The weather yesterday was absolutely stunning, which made the ruins look even more interesting as the shining sun brought out some lovely shadows that made parts of the ruins look a little eerie. The castle was destroyed twice, during the 1400 and 1500s, which explains why what would've once been a fantastic display of Polish architecture came to be in such a state of disrepair. It was a definitely a surprise visit, as I knew we visiting Lake Solina but apparently this was a spur of the moment move by Piotr and I did enjoy it a lot but it just didn't compare to the incredible views that I'd seen earlier from by the lake. I feel like if I had seen the ruins first, I would've been more blown away by its beauty. What's in my (everyday) make-up bag? Things I hate about Adulthood!